Popular with both guests and city centre workers alike, lunch at the Jackson Court Hotel the ideal choice. For an exciting stay in Dublin, this lively Georgian hotel in the heart of the city centre is the perfect choice. 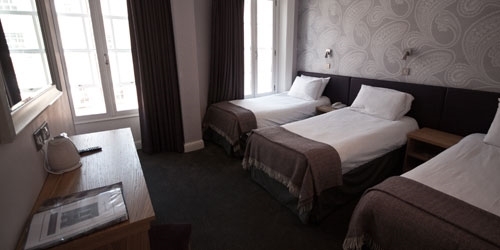 The Jackson Court Hotel is in an excellent central location in Harcourt Street in Dublin City. The hotel is adjacent to Grafton Street, Dublin's most popular & famous shopping street. We have discounted packages which you will not find anywhere else! Behind the façade of a Georgian townhouse The Jackson Court Hotel in Dublin City Centre offers all the comforts and convenience of a modern hotel in Dublin. 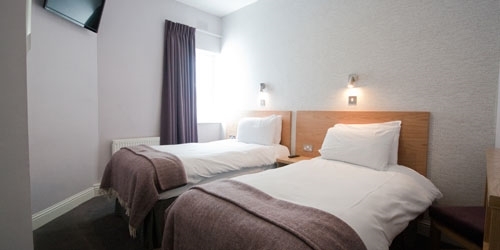 This Dublin City hotel is situated on the bustling Harcourt Street, just 5 minutes walk from Grafton Street and St. Stephens Green. The LUAS green tram line runs directly outside the hotel and takes you to the south side of Dublin. Our Dublin Hotel comprises of 36 bedrooms, a bar & restaurant and the renowned Copper Face Jacks nightclub. It is best described as a lively hotel, having a popular nightclub on site. Guests are advised that rooms can suffer from noise. Offering great value for money and excellent special offers, this is the ideal place to stay in Dublin, whatever your reason for visiting. This central Dublin Hotel is ideally located within walking distance of the most popular visitor attractions in Dublin City Centre. The hotel is adjacent to Grafton Street, Dublin's most popular & famous shopping street. The tranquil St. Stephen's Green to just a short walk away and is an ideal place to escape the busy city centre and enjoy a peaceful walk and the beauty of the park. The popular Temple Bar, Guinness Storehouse, Trinity College & Dublin Castle are all also within a short walking distance to the hotel. Stay at the Jackson Court Hotel and enjoy all the best in Dublin's shopping, tourist attractions, Dublin venues and nightlife - right on our doorstep! The Jackson Court Hotel is home to Copper Face Jacks, one of Dublin's best known night spots. The club comprises of 6 bars, each with their own individual style, from modern & sleek to traditional. There are two heated and covered beer gardens with a balcony area and large LCD TV screens. Our premium level, a tastefully decorated private room located on the second floor, is ideal for private functions and parties, product launches and events. Call us on +353 (1) 475 8777 for enquiries. Copper Face Jacks is open 7 nights a week. Guests who book directly through our website receive FREE entry into the club.